March 7, 2016 – Today, we’re climbing into the Wayback Machine and setting the dial for the early 1700’s, when temperatures ran high in politics, the press, and from a smallpox epidemic burning through Boston. Leading us on this journey is Stephen Coss: author, ad guy, and “close personal friend of Ben Franklin.” Everything, Stephen says, that Franklin really needed to know, he learned in 1721 (and he’s only half joking). 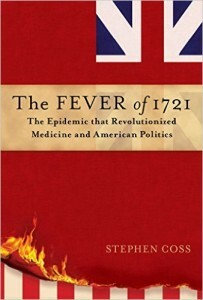 Stephen’s debut book is The Fever of 1721: The Epidemic that Revolutionized Medicine and American Politics . In it, we meet historical figures including the young Franklin laboring at his brother’s newspaper, and the Reverend Cotton Mather, seeking redemption from the debacle Salem Witch Trials by pioneering the technique of inoculation against the dreaded pox. An unlikely advocate for something as revolutionary as vaccination, Mather convinces only a single doctor — Zabdiel Boylston — to try what we’d call a clinical trial on the controversial technique, one frowned upon in part because it had been practiced in Africa. You can follow Stephen @Coss1Coss on Twitter, or visit him at StephenCoss.com. In this episode, we also mentioned David Pietrusza’s new book, 1932: The Rise of Hitler and FDR – Two Tales of Politics, Betrayal, and Unlikely Destiny .